No other computer switches its operating system as easily as the Raspberry Pi: Just slot in an SD card with a different OS image, reboot, and you're done. But, which of the available Rasp Pi operating systems is best for you? Most of the systems that run on Raspberry Pi are versions of the Linux operating system. Because Linux is open source, developers can tailor it for specific purposes. In the case of the Raspberry Pi, the light hardware requires a scaled-down system free of unnecessary applications and the "code bloat" common on many desktop systems. Also, systems that run on Raspberry Pi must be compiled for the Rasp Pi's ARM processor – an ISO image created for a desktop computer with an Intel processor won't work. 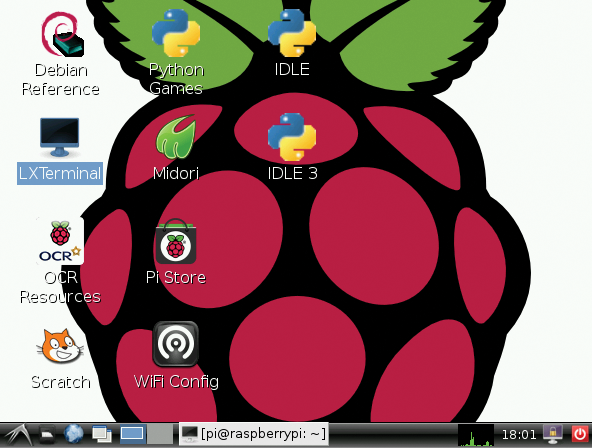 This article introduces some of the operating systems designed to run on the Raspberry Pi . As you will learn, many of these systems are ported from popular mainstream Linux distributions. Often the choice of a system is a matter of taste, but you might find that some systems work better for the way you intend to use your Raspberry Pi. If you want to experiment, you can just burn different systems to different SD cards and trade them out whenever you want a new look. Or, you can try a system like NOOBS or BerryBoot, which offers up a convenient menu for choosing an operating system at boot time (see the "NOOBS and BerryBoot" box). 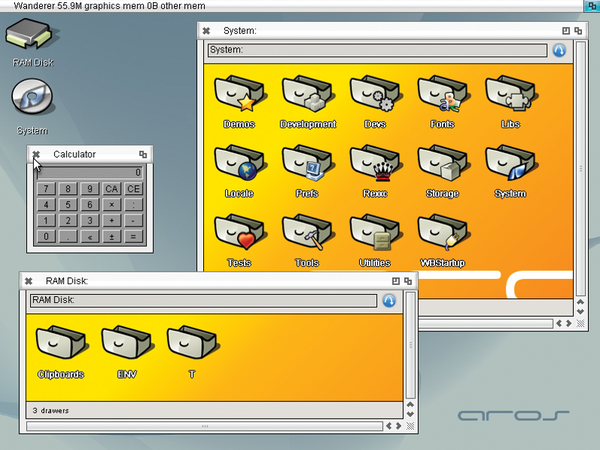 You can even access an Amiga-like operating system (see the box titled "AROS – A Special Case"). AROS  is based on the operating system of the Commodore Amiga, and it is compatible with Amiga APIs. Thus, you can theoretically recompile a program written for the old Amiga Workbench, which does not access the hardware directly, for AROS. The open source project has its origins in the period of the mid-90s when, after the failure of Commodore, Comodore fans created an equivelent system for PCs with x86 processors. Later they also ported the code for a variety of other processors. Currently, the native Rasp Pi implementation cannot be used, however, because some hardware drivers still have to be developed. There is a Linux-hosted version for doing this: You first boot any Linux (e.g., Raspbian), then you can download the nightly build binary  for ARM processors and run AROSBootstrap from this archive. AROS then launches (Figure 1) using the Linux driver for hardware access to the Rasp Pi. Much work here is unfinished, but AROS promises to blossom into a nice gimmick for Pi owners who once had an Amiga. Figure 1: AROS brings that Amiga feeling to the Raspberry Pi. NOOBS and BerryBoot do not actually act as a complete operating system but combine a boot manager and an installation helper to let you boot other systems. To begin, format the SD card on the PC using the FAT32 filesystem, then unpack the NOOBS  ("New Out Of the Box Software") ZIP file onto it. Next, boot from the SD card, and you will reach a boot menu that lets you select whether you want to install Raspbian, Pidora, Arch Linux, OpenELEC, Raspbmc, or RISC OS. All other installation procedures are automatically handled by NOOBS. For a change of the operating system, simply press the Shift key immediately after the boot process starts to choose a different system from the selection menu. If you do not press the Shift key, you will boot to the most recently installed distribution. BerryBoot  takes users one step further in the direction of a boot manager. Again, you first unpack the archive file on a FAT32-formatted SD card. After booting, BerryBoot offers to install a desired OS on the SD card. Alternatively, BerryBoot stores its boot files on a USB stick or a hard drive connected to the Rasp Pi. Additionally, you can simultaneously install multiple operating systems with BerryBoot, then select from a boot menu when starting your Rasp Pi. Package Manager – In the Linux world, users connect to package repositories to download new applications. The concept of a package repository was later adapted by Apple for the iPhone App Store, but in Linux, almost all of the applications are free. Several package formats and package management tools coexist in the Linux space, and users often form preferences about Linux distributions based on the repositories and package tools. The leading package tools are based around Debian repositories (with tools like Apt-get and Aptitude) and the Red Hat Fedora repositories (with tools like Yum). The Raspbian distro uses a Debian-based package environment, and Pidora uses RPM-based Red Hat packages. Some other distros, such as Arch Linux, maintain their own package management systems. Desktop – The desktop environment, with its distinctive screen layout, menus, and desktop applications, is another distinguishing feature of Linux systems. Popular desktops like Gnome and KDE are too bulky for the Raspberry Pi, which runs better with lightweight systems like LXDE and Xfce. Some Rasp Pi systems dispense with the graphic desktop altogether and boot directly to the old-fashioned command line. Multimedia – Some systems are optimized for audio and video playback. As you'll learn in this article, a number of Rasp Pi alternatives are intended to outfit the Pi as a media center. As is often the case with specialization, these systems are quite convenient for their intended use case, but they give up some flexibility if you want to use your Pi for other things. Beyond these differences, you will find that the systems offer many of the same applications – either preinstalled or at least available for download. Most systems will support the projects described in this issue, although you might have to adapt some of the setup procedures. They all look quite similar once you get to a terminal window. The most popular OS for the Rasp Pi is certainly Raspbian , a custom version of Debian GNU/Linux specially tailored for the mini-computer. Debian is widely used in server systems, and it forms the basis for several popular desktop distributions, such as Ubuntu. Thanks to the 35,000 packages in the Debian repositories, the user can draw on a huge amount of free software. Raspbian is available in two variants: hard float and soft float. The difference between these variants has to do with how the system handles floating point numbers. The hard float form is much faster, so you will likely prefer it in almost all cases. However, if you want to use the Java VM from Oracle, you must use the soft float image. If you program in Java, or if you plan to run applications written in Java, you might want to consider the soft float edition. After booting, Raspbian automatically starts the raspi-config tool that lets you customize key settings, such as the password and time zone in a small menu. Here, you can also select whether to boot to the lean LXDE graphical desktop (Figure 2) at boot time. The user interface and the Start menu of the graphic desktop help newcomers quickly find important programs: Thanks to the nimble WebKit engine, the Midori browser lets you surf the web at fast speeds; the visual development environment Scratch is also preinstalled. Figure 2: The most widespread Rasp Pi distribution: The Debian GNU/Linux descendent, Raspbian. If you also want to use your Rasp Pi for office work, you can use the package manager to install LibreOffice conveniently off the web. Despite its richness of features, the free office suite reacts surprisingly quickly. You'll see no performance issues with ordinary tasks, at least on the B model with 512MB of RAM. Understandably, however, huge tables with extensive computations take the Pi to its limits. Raspbian is rightly considered the standard distribution for the Rasp Pi. On one hand, it facilitates a newcomer's first steps with the mini-computer, which is why it also forms the basis of many tutorials. On the other hand, advanced users who have used Debian or one of its derivatives already feel comfortable with it.